December 17, 2015 | By: Paul Rianda, Esq. Given the fact there have been a number of successful lawsuits against cash advance companies in California, many cash advance companies have decided to take a different route and get a lending license to provide loans to merchants in the state. 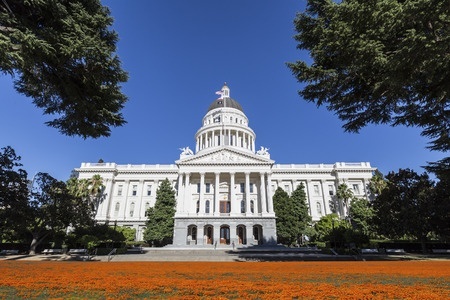 If done correctly, this can allow companies to provide loans to merchants in California at roughly the same profit margins one could expect from a cash advance. Below I will discuss the process for obtaining a California lender’s license and some tips for making that process less painful. 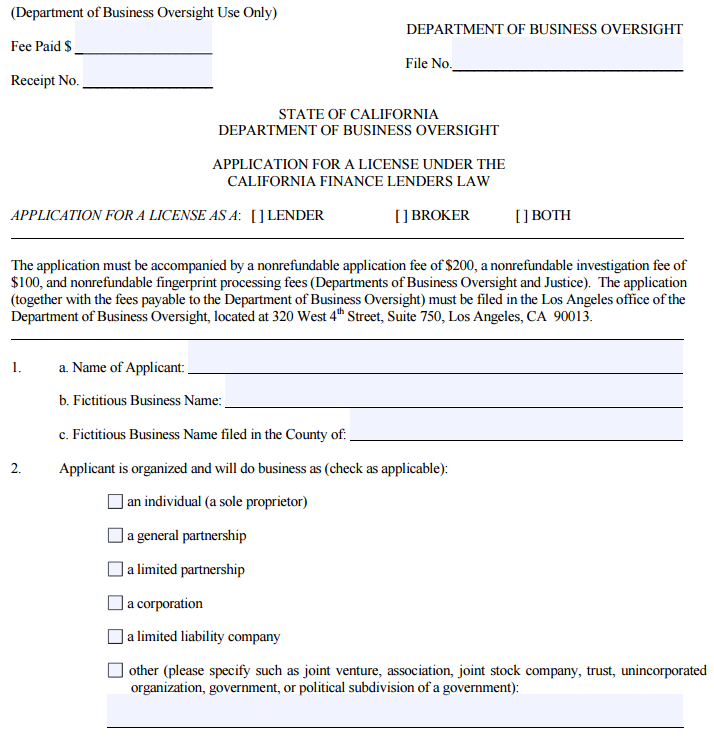 To start, go to the California Department of Business Oversight and get the form titled “Application for a License Under the California Finance Lenders Law.” The application is long and detailed but don’t let that scare you. Most of the information you provide is really more related to letting the State know about your company and the main people that will be responsible for managing the lending operations. As you complete the form, one thing you do need to do is make sure you are very careful and meticulous as any small mistake will cause the application to be rejected making the process much longer. The first part of the application requests basic information about your company and its officers. In filling out this and other parts of the application, it is essential to respond to all the questions. If you fail to miss just one response the application will be rejected. To that end, even if a question does not apply to you I find it better to respond “N/A” or “not applicable” rather than just leaving a blank. By doing that you force yourself to fill in every blank and therefore reduce the chances for missing a response resulting in a rejection of your application. Also, you need to be very precise in your responses. I have experienced a situation where the examiner rejected an application because the name of the company was incorrectly spelled on the application. The name of the company was submitted on the application with “Inc” instead of the complete “Inc.” at the end of the company’s name. The examiners are very good at what they do and very thorough. You need to make sure the packet you submit is perfect and also that there are no inconsistencies in the document. Another important point to remember is that the application requires you to name the person that will be responsible for running the location where the lending is occurring. The main requirement is that the person running the location must be physically present at the location. As a result, you could not manage a California office remotely from New York for instance. In another twist, if your principal location is out of state, you will need to get the license and fill out the main application for that out of state address. For the California location, you will need to fill out the short form application in addition to the main application and submit the short form application as part of the packet to allow the license to apply to the location in the state of California. There are a number of exhibits you also have to provide as part of the process. Some of them are simple like a balance sheet for the company. It is acceptable that the company is new and has little in the way of assets. You just have to make sure you attach a balance sheet and that it is prepared in compliance with generally accepted accounting principles. I have seen times when the balance sheet was rejected because there was no line items for liabilities for instance, even though the company was new and therefore had none. It is probably wise to engage your accountant to make sure you submit a balance sheet that complies with those guidelines. You also have to get a surety bond in the amount of $25,000. There are readily available bonding companies that specialize in providing these bonds. In addition, you need some other exhibits like a statement of good standing for your company, authorization for financial disclosure, social security number (on a separate exhibit), organizational chart and a few other documents. As with the rest of the application the key is to make sure you include everything they are asking for exactly as requested. The most involved exhibit is the “Statement of Identity and Questionnaire.” That exhibit has to be filled out for each owner, officer and manager listed on the application. It requests detailed information going back 10 years for each person for items like residence address and work history. In addition, there are a series of questions on topics such as whether the person has been involved in lawsuits, had any licenses revoked or declared bankruptcy. Fingerprints are also taken as part of the process. This part of the application is trying to vet the various people working for the company to make sure they are suitable to be in the lending business. Once you have all the documents prepared, you need to put them together in a packet to send off to the Department of Business Oversight to be reviewed. Again, I cannot overemphasize how important it is to completely and accurately answer the questions and put the packet together. You need to make sure things are in the proper order and complete. Triple check the application for errors and to make sure that packet is presented in the best manner possible. You also need to determine the amount of fees to submit with the application. Then, send the package by overnight delivery to make sure you have proof of delivery. So what happens next? Well there is usually a bit of a wait. Typically it takes 3 months or more to get a reply. If you have done your homework, you might get lucky and successfully get your license on the first try. If there are any deficiencies, you will get a response letter from the State detailing the items that need to be corrected in the application and a time frame in which you have to respond or the application is abandoned. On the first go round, you are usually given at least 2 months so you should have plenty of time. Digest the things they want and provide the required information. The deficiency letters are very detailed so it should be easy to make the requested changes. Resubmit the requested items and wait for the next response. It could be in the form of another deficiency letter but it could be an approval of the license. Just keep on trying until you are finally successful. That’s it, you are finally a licensed lender in California! But that is where the fun begins. You are subject to many laws in California and audits by the State. To get the right to operate as a licensed lender, you need to make sure you prepare your application correctly. Once you have done that, you need to get all your loan documents drafted in compliance with California law. Make sure you have adequate experience and professional help to take on those tasks.